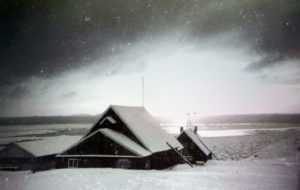 The Mission House (built in 1751) was built by the Danish Christian missionary Poul Egede and was in service until 1880. It was intermittently inhabited until the mid-1980’s. The Shop and Store Building (built in 1777) maintained its original use as a warehouse until 2012. 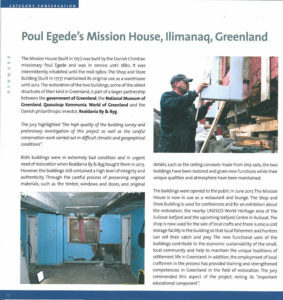 The restoration of the two buildings, some of the oldest structures of their kind in Greenland, is part of a larger partnership between the government of Greenland, the National Museum of Greenland, Qaasulsup Kommunia, World of Greenland and the Danish philanthropic investor, Realdania By & Byg. Each year, the Awards are presented to outstanding achievements of European significance. 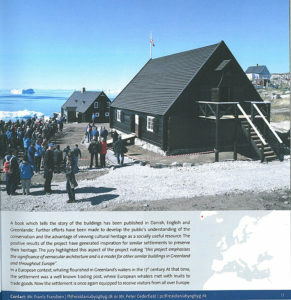 The two buildings in Greenland received an Award in the Category Conservation. Conservation projects include: the restoration of buildings and their adaptation to new uses, new buildings in historic settings; urban and rural landscape rehabilitation; archaeological site interpretations, and the care for art collections. Peter Cederfeld with the Europa Nostra Award. The employment of local craftsmen in the process has provided training and strengthened competencies in Greenland in the field of restoration. The jury commended this aspect of the project, noting its “important educational component”. Efforts have been made to develop the public’s understanding of the conservation and the advantage of viewing cultural heritage as a socially useful resource. The positive results of the project have generated inspiration for similar settlements to preserve their heritage. The jury highlighted this aspect of the project noting “this project emphasises the signifance of vernacular architecture and is a model for other similar buildings in Greenland and throughout Europe”. An Award cerimony has been held in Det Grønlandske Hus / Kalaallit Illuutaat in Copenhagen on the 24th September, 2018.